I work at the Eugene Mission. Everyday I'm confronted with people who are experiencing homelessness, which in and of itself is traumatic. But worse still, by society they are seen as a “problem” to be solved. They are seen as different, as defective, as “Other than.” Other than my crowd where we have careers, intact families, social status, goals, and hidden addictions (as opposed to obvious or more stigmatized ones). Other than my crowd who want to see and be seen as beautiful, smart, funny, and capable. These “homeless” men and women have been set aside by society as too much. Too much addiction, too much mental illness, too much age, too much obstinance. Just too much need for society to fill. And they would often agree that their lives are too much. Too much pain, too much poverty, too much heartache, too much trauma. One of the things I often hear in relation to the struggles facing the “homeless” is that if they could just meet Jesus, surely their problems would be solved. I don't think the solution is quite so simple, because the problem is complex. You see on the street and in the shelter...faith in Jesus is alive and well. They have faith in Jesus, it's people they lack faith in. They've been let down by people most of their lives, some of them from birth. God is very real to them and has seen them though unbelievable adversity. But, in the practical aspects of their big life problems, they have been given no answers. They use methods of surviving pain that have been modeled for them. Anger, alcohol, illicit drugs, codependent relationships… all short term solutions with long term consequences. The parents and family members charged with giving them life coping skills either didn't possess them themselves, or were otherwise engaged with their own problems. The peripheral people in their lives either expected more than was reasonable, or made judgments based on assumptions. They saw them as Other and therefore didn't see through to the real person. I learn what true courage looks like when I look in the face of a 70 year old man who's been homeless his entire adult life because of a mistake he made as an 18 year old. I learn what fortitude looks like when I am greeted with a smile from a woman who is in a wheelchair because her leg was amputated after a car accident. She started using heroin after the pain prescriptions ran out, which caused her family to throw her out on the street where she has lived for three years. She is 2 months clean and using Suboxone to help her stabilize. I learn what hope looks like when a mentally-ill, 65 year old woman tells me how she is looking forward to being in heaven with Jesus and the angels someday. She's been in the State Hospital recently and just wants to get a small apartment someday where she can have a cat. I think the greatest thing I've learned from the people living at the Mission is that we are all Other. Because we can't understand one another out of context of our story. If I don't understand you, I'll naturally see you as different from me - Other. However, once I know your story, your behavior makes sense. And, if I'm honest, I can see a part of me in it. I hear a lot of stories at the Mission and I no longer see Other in the faces of those telling them. Instead, I see myself reflected back. 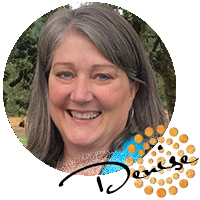 Denise Jubber is a Licensed Professional Counselor and Spiritual Director who is passionate about supporting people as they navigate various seasons of life. She is acquainted with the complicated issues of life, yet knows God can bring about good change and significant personal growth even through seasons of difficulty and struggles. As January 1st approaches, I am pondering the turning of the calendar. The fact that much of the civilized world celebrates the minute the clock strikes midnight is really quite profound. Every country has a tradition that is practiced by a large percentage of its population. You are probably familiar with the tradition in the United States of kissing at midnight, but did you know the practice is rooted in the belief that it is an auspicious gesture that purifies everything that is evil? In the American South, many believe that black-eyed peas symbolize coins and eating them insured economic prosperity for the coming year. In some Latin American countries, including Mexico and Brazil, it's believed the color of one’s undergarments will influence what kind of year they’ll have. Tradition holds that yellow underwear will bring prosperity and success, red will bring love and romance, white will lead to peace and harmony and green will ensure health and well-being. In Wales, the door of the house is first opened and then immediately shut. This symbolizes releasing the old year and locking out all the bad luck it brought. At the 12th toll of the clock, the door is reopened to welcome the New Year will all its goodness, luck and prosperity. I find it interesting that many of the New Year’s traditions have to do with getting rid of bad and bringing goodness our way. There is something attractive to humans about getting another chance for an auspicious outcome. The New Year seems to represent the ultimate “Do Over” and a hope that things will be better going forward. Millions of people show up every year in Times Square to watch The Ball drop at midnight and millions of others across the world watch it on TV. We celebrate the old year being gone along with it challenges, and the year ahead being new and full of hope for better. I think life with God, can be like New Year’s Eve in Wales. By releasing the bad when I am in need, through prayerfully opening the door of my heart to God and admitting my shortcomings, in the amount of time it takes for the clock to toll 12 times, Grace will usher in goodness. This New Year’s Eve, I invite you to do more than engage in traditions that are rooted in vague beliefs based on superstition. But rather, open the door of your heart to God, letting shortcomings, shame, disappointment, or any other “bad” out. Then keep it open, letting Grace bring in goodness, molding you into a New Creation. If anyone is in Christ, they are a new creation; old things have passed away; behold, all things have become new.